The Obama Administration is willing to untighten the arms embargo on Libya to help fight the Islamic State group if the Presidency Council makes concrete requests, US officials say. “If the Libyan government prepares a detailed and coherent list of things that it wants to use to fight ISIL and responds to all the requirements of the exemption, I think that the Security Council members are going to look very seriously at that request,” a senior administration official told AFP. “There is a very healthy desire inside of Libya to rid themselves of ISIL, and I think that is something we should be supporting and responding to,” the official said, using an acronym for the group. Washington will intervene on behalf of the Presidency Council to carve out exemptions to an embargo introduced by the Security Council in 2011, during Kadhafi’s failed attempt to suppress a popular uprising. 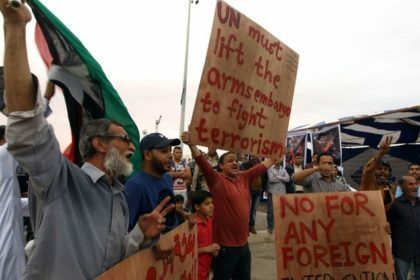 During a trip to Cairo this week, Head of the Presidency Council Faiez Serraj slammed the international community indicating that Libya can never overcome IS with the embargo still in force and urged the United Nations to lift the ban so that Libya can better equip its army. Since entering the country in 2014, IS has been able to establish its rule, mainly in coastal regions including in Kadhafi’s home Sirte, seating some 100km from European coasts. The group has recently lost ground and was pushed in its stronghold of Sirte due to advances of the Libyan National Army (LNA) loyal to Tobruk-based House of Representatives (HoR) and other militias opposed to the LNA Gen. Khalifa Haftar. The discussions to loosen the embargo will take place Monday during a meeting between US Secretary of State John Kerry and his counterparts of regional powers in Vienna, reports say. Libya’s neighbors have been against a military intervention in the North African country warning that such action will be disastrous for the region. They further underlined that Libyan internal affairs is the concern of Libyan authorities. Egypt has also backed Libya’s call for the removal of the ban. Given the fact that Libya still has no unified army, there are fears that arms to be possibly sent may fall in wrongs hands. “There is no unified chain of command; there are still factional armed forces that are still more focused on fighting each other than on fighting ISIS,” said Frederic Wehrey, a Libya expert at the Carnegie Endowment for International Peace.